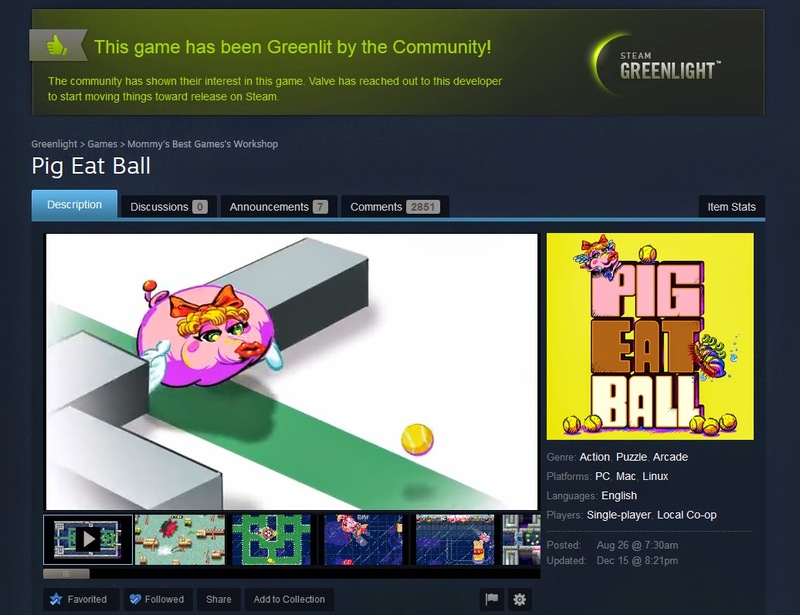 Mommy's Best Games' Dev log: Pig Eat Ball Greenlit for Steam! Pig Eat Ball Greenlit for Steam! It's official--Pig Eat Ball has been Greenlit by the community and approved for sale on the Steam digital marketplace! This is great news, as the 'Steam' store is where around 90% of all PC game sales occur, so it's great to have the game set to be sold there. The game is still in development and we're targeting a Spring 2015 release. You can pre-order the game, for a early-bird discount, here: www.pigeatball.com. And to accompany the Greenlight announcement, I've recorded a playthrough of one of the levels in the second world in the game. This is from world 2, the Sushi Gardens, and it's the 8th level, which is named "The Barfopolis". Usually I cut a much shorter, quicker trailer, but because Pig Eat Ball is so strange, and sometimes tough to understand in a standard trailer, I wanted to show the un-cut gameplay so people can better get a sense of it. Enjoy!